We want to be the first to send the “First Lady of Racing,” Penny Chenery, our warmest wishes for a Happy Birthday on January 27! Last year was a milestone birthday at age 90, but this year will also be very special for Penny. It marks the 40th anniversary of Secretariat’s historic Triple Crown of 1973. His fame remains undiminished by time, largely due to Penny’s tireless efforts as his ambassador and her dedicated stewardship of his glorious legacy. As legions of fans know and appreciate, Penny did not retire from the scene after Secretariat retired from racing. She continued to graciously greet her horse’s admirers at events all across the country, signing autographs for hours at a time. She served as president of the Thoroughbred Owners and Breeders Association from 1976-1984. She was also president of the Grayson Foundation supporting equine research in 1985-86. In 1983, she was elected to membership in The Jockey Club, one of its first women members. A leading advocate for the health and welfare of retired Thoroughbreds, Penny was instrumental in creating the Thoroughbred Retirement Foundation. 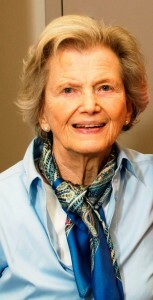 She established the Secretariat Foundation to help support worthy causes, such as laminitis research. In 2005, Penny received the Eclipse Award of Merit for lifetime achievement in racing. In 2012, the Thoroughbred Club of America’s honored her at its 81st Testimonial Dinner. 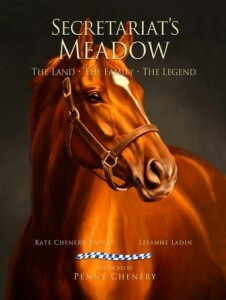 We in Virginia are proud of Penny’s ties to our state as the birthplace of Secretariat at The Meadow, the farm founded by her father, Christopher Chenery. Under her leadership, Meadow Stable produced not only Secretariat, but Riva Ridge, who won the 1972 Kentucky Derby and Belmont. Together they won five of six consecutive Triple Crown races in 1972-73, something no other stable has ever done. 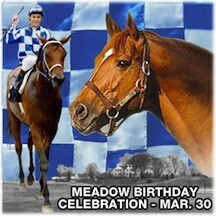 Moreover, we are thrilled that Penny is scheduled to attend the SECRETARIAT BIRTHDAY CELEBRATION AT THE MEADOW on March 29-30. This event, the bulk of which takes place on Secretariat’s birthday of March 30, will kick off the official celebration of his Triple Crown anniversary. Ron Turcotte, Secretariat’s jockey, and Charlie Davis, exercise rider, are also slated to attend. In the meantime, Happy Birthday, Penny, with deep gratitude for your magnificent champions and your inspiring career! We will see you soon! This entry was posted in Uncategorized and tagged Chris Chenery, horse racing, Meadow Stable, Penny Chenery, Riva Ridge, Secretariat, Secretariat Birthday Celebration at The Meadow, Secretariat movie, Secretariat's Meadow, The Meadow, Thoroughbred Retirement Foundation, Triple Crown by admin. Bookmark the permalink. I would like to send you a very Happy Birthday greeting Ms. Chenery. I love your Secretariat,and I also love how you keep his memory alive. I wish you many more birthdays to come. Happy birthday Ms. Penny! Hope you have a wonderful birthday and happy 40th celebration for Secretariat coming up. Love you and loved Secretariat. I own one of his granddaughters and love her and her daughter dearly. Thank you for sharing Secretariat with us. I hope you have one of the best Birthday’s to date! You are such a remarkable woman and I look up to you for all that you have done in your lifetime. With the story of Secretariat, you showed us how it takes a Village to raise a Champion. Your tireless efforts demonstrated the value of an engaged horse “mom”. 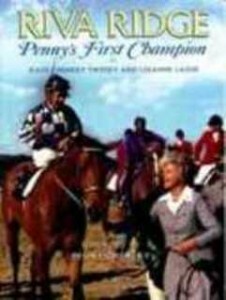 HAPPY BIRTHDAY PENNY, I LOVE SECRETARIAT, AND YOU ARE GREAT………………….!!!!!!!! Here is wishing you a Very Happy Birthday and many more to come!! I loved that photo of you standing with my Dads all time favorite racehorse, Secretariat!! Happy Birthday Penny. I respect and honor you and admire the life you have lived. Thank you for being one of the thoroughbred owners that obviously believes in taking the best of care of your horses. Apparently God has blessed you because of your deserving ways. Thank you. A very Happy Birthday to (in my humble opinion) the First Lady of Thoroughbred racing. Thank you for your tireless work on behalf of the breed. Happy Birthday Mrs. Chenery!! Hope all your wishes come true . Have a Marvelous day & many more B/d’s to go!